As the visitor approaches William Daniels’ 10 new ‘oil on board’ paintings (as yet all untitled), the scale of these works becomes more surprising the closer you reach them. They achieve a disarming physical and visual presence. 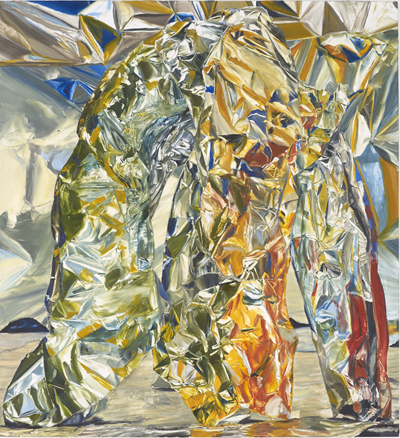 No picture is larger than 38 centimetres high or 29 centimetres wide, but any initial, modest impact is radically changed by the exuberant descriptions of colour, tonality and geometry seen by the artist in the folds of crumpled metal foil. Having previously exhibited paintings of paper maquettes, inspired by iconic images in art history, Daniels now turns to an investigation of representation in painting. He explores how light operates on the reflective surface of these foil objects, which appear to sit against a backdrop of the same material to enhance the mirroring of ambient light. These ‘formless’ shapes first attract and then return the light in altered, complex patterns. Such closely cropped and intricate paintings invite sustained viewing to comprehend the detail held within them. Fractals of grey and yellow or red and olive meet awkwardly and fight for space. Colour and form are in constant flux producing a hallucinatory effect like staring through a spyhole into a fiery furnace. Every facet and wrinkle made by compressing the foil sheets into solid, abstract forms is articulated with adroit brushwork; flatter flecks of colour are separated by raised ridges of paint marking hard edges in the original objects. Daniels’ textured surfaces faithfully express the physicality of the material he studies. This act of turning flat sheets into form cleverly exposes and reverses the traditional act of painting itself, the translation of tangible objects into a two dimensional plane. In Daniels’ quest for dazzling optical effects, the paintings achieve a theatrical trompe l’oeil character. However, there is an ambiguous quality about these images, illustrating the curious status of painting itself. Daniels reminds us that painting is a lyrical resemblance, a dialogue between the ‘real’ and the imaginary, which in this show produces an exhilaratingly giddy experience.